In chapter 41 Joseph goes from slopping swill for the inmates in prison to crowds parting to make way for his chariot. Was there ever such a sudden elevation in all of history? I once took a ride on a coaster called The Volcano. It was a VERY quick assent. During that Volcano ride – it was hard to maintain my perspective… Am I up? Am I down? Rapid promotion can do that to you… you become disoriented. Imagine how Joseph must have felt! 2. Tell the Bad With the Good. It is helpful to remember this on your elevator ride to the top: Wealth isn’t yours to squander; and you may need some of that wealth tomorrow. Joseph lived by these principles. Joseph’s plan to store up in the prosperous years so that they might survive the lean ones… is still a good one. Now matter how golden we imagine our futures… we can only see so far. Being prepared is a Biblically sound idea! With all the perks that came with Joseph’s new job, he never forgot that first and foremost in his job description was to be a blessing to the world. We can either treat our homes as a treasure chest… or a store house. When we treat them as a treasure chest… we invest time and energy protecting our stuff… and life can become a hassle. When we treat them as a store house… we realize that God can bless others through the “stuff” we are temporarily holding for him… and life becomes a blessing. Okay… so the elevator doors are opening. Let me hold the door for you. 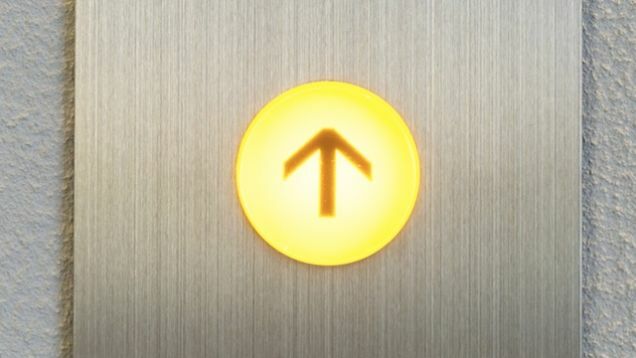 “Going Up?” I ask. Somewhat embarrassed you respond: “Yes…” Great! But just remember… don’t let your success destroy your humble confidence… or let it tear at your desire to speak up for the truth… or let it stop your from displaying good money management skills… or… above all this… I say this to you as you enter the threshold… don’t let it keep you from blessing others! Rise up and bless the world. That is your calling! Let Me Be the Donkey! The Disciples: John 12:16 says indicates that they were puzzled by the whole spectacle. The Curious: John 12:18 says that many went out to get a look at Jesus. There seems to be (besides Jesus) only one person calm in this entire account. 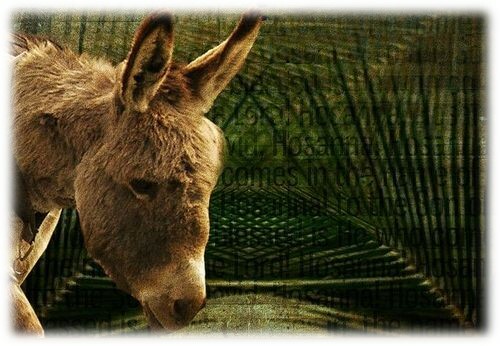 Serving in a steadfast and gentile manner is the donkey. There have been times in which I have read this passage and pictured myself in the crowd with the palm branches. My hosanna ringing louder than my neighbors! But this is the same crowd that would turn on Jesus at the end of the week. I certainly don’t want to be like them. I don’t want be dumbstruck like the disciples or a curiosity seeker like others that day or be stubborn and angry like the Pharisees… so if I have to put myself in the story. Let me be the donkey. He is the model of Christian servant-hood and leadership here. We could learn a lot from this donkey. As Christian leaders, Pastors, Elders, Deacons, etc. bear a tremendous load. And they are called to bear it with dignity and grace. They must also be steadfast and yet not falter… never losing sight of their goal and mission. And added to all these things… humility is paramount!